Dr. Michael Moorehead was born and raised in Zanesville, Ohio, graduating from Maysville High School in 1972. He then went to The Ohio State University for both undergraduate and professional school where he graduated with honors from the College of Optometry in 1979. Dr. Mike became a post-graduate student and clinical instructor at the University of Houston where his studies emphasized eye muscle disorders and amblyopia (lazy eye). 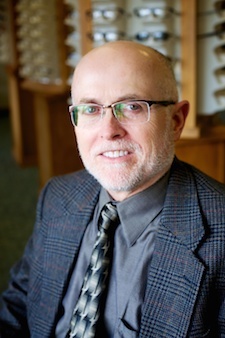 After six years in private practice in the Houston area, he returned to Ohio to establish the Hamilton Eyecare Center in 1988. He is certified as a therapeutic optometrist for the treatment of glaucoma and anterior eye diseases and is certified in pre- and post-operative care of LASIK refractive surgery and cataract surgery. Dr. Mike particularly enjoys fitting challenging specialty contact lenses. Dr. Mike has traveled to the Amazon Region of Brazil eight times with Amazon Outreach Mission Organization to perform eye exams and fit used eyeglasses on over 2,500 people. He enjoys reading, playing the guitar, working out at the gym, and riding his motorcycle. 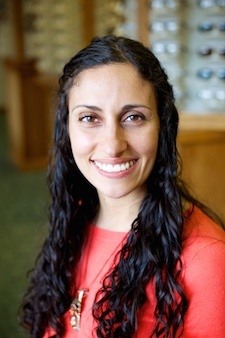 Dr. Diana Bollenbacher joined Hamilton Eyecare Center in January 2014. She graduated from the University of Georgia in 2008 and then earned her Doctor of Optometry degree from the Southern College of Optometry in 2012. During her studies, Dr. Diana completed two competitive externships: one at a private practice specializing in contact lenses and primary care and the other at a referral center specializing in ocular disease. In addition, she participated in a medical mission trip to Colombia, providing free eye exams and glasses to those in need. During her free time, Dr. Diana loves to travel and experience new cultures. She also enjoys camping and hiking with her husband and dog.